In his very useful pocket-guide The Caliphate: A Pelican Introduction (2016), the historian of medieval Islam Hugh Kennedy convincingly argues that “caliphate is a concept with a wide variety of meanings and interpretations.” These include the Sunni ideal of the Four Rightly-Guided Caliphs (al-khulafa’ al-rashidun), Qurayshi Arabs who ruled the Muslim umma in its earliest, golden age; the radical Kharijite vision of the caliph as the most pious and most meritorious Muslim, of whatever background; the ‘Abbasid presentation of the caliph as ruler of a universal empire; the Shi‘i vision of the Imams of ahl al-bayt, the family of the Prophet, who have access to the inner meaning (batin) of revelation; and the contemporary jihadi-salafi caliphate of the Islamic State. Yet Kennedy’s survey makes no mention of Sufi or “mystical” interpretations of the caliphate—“Sufism” or Islamic mysticism does not appear in the book’s index. This is perhaps unsurprising: rarely are the caliphate—a supposedly “political” institution—and Sufism—a “religious” or “spiritual” movement—mentioned in the same breath. Why did such a “mystical turn” take place around this time? Yilmaz’s answer seems to be twofold. First, he highlights the central place of Sufi piety—manifested in Sufi guides (s. pir, shaykh) and orders (s. tariqat)—within Anatolian Islam from the very beginning of the Ottoman period in the late thirteenth and early fourteenth centuries. While attention is often given to the role of heterodox and antinomian “dervish” groups within the early Ottoman frontier state, it should not be forgotten that the great centre of the highly literate Ibn ‘Arabian tradition of Sufi thought in the later medieval period was Konya in southern central Anatolia, the home of Sadr al-Din Qunawi (d. 1274), Ibn ‘Arabi’s son-in-law and designated successor. It should not come as a surprise, then, that the first director of the first Ottoman madrasa, at Iznik, was Dawud Qaysari (d. 1350), who was a student of Qunawi’s student ‘Abd al-Razzaq al-Qashani (d. 1329) and whose introduction to his commentary on Ibn ‘Arabi’s great work, Fusus al-hikam (The Gemstones of Wisdom), became the most widely read introduction to Ibn ‘Arabian Sufi thought. Similarly, Molla Fenari (d. 1451), “the first reported sheikh ul Islam of the Ottomans” (p. 281), was the major exponent of Ibn ‘Arabian monistic cosmology (the so-called doctrine of wahdat al-wujud, “the unity of existence”) in Anatolia in the fifteenth century. This tendency for the Ottoman elite to draw upon the legacy of Ibn ‘Arabi became even stronger following the conquest of Egypt and Syria in the second decade of the following century, with Ibn ‘Arabi, who was buried in the newly Ottoman Damascus, becoming something of an Ottoman “patron saint” around that time. It was perhaps only natural, given this legacy, that Ottoman political writing in the Age of Süleyman should take on an Ibn ‘Arabian Sufi hue. While the Sufi turn in political thinking was therefore something of an organic development within Ottoman thought, it can also be seen in broader geopolitical terms as part of an Ottoman response to the threats posed by, first, the Timurids of Central Asia—the descendants of Tamerlane, who inflicted an existential-crisis inducing defeat on the Ottomans at Ankara in 1402—and, second, the Safavids, who ruled Iran as a Shi‘i state from the 1501. These threats were intertwined. In response to the defeat at Ankara, the Ottomans turned away from their original support base, the Turkoman tribes and dervish orders of Anatolia, creating a centralized and institutionalized political system founded upon Persian cultural and political ideals. This led to a wave of Turkoman rebellions against the Ottoman state led by Sufi figures (whom Ahmet Karamustafa has called “God’s unruly friends”) such as Bedreddin of Simavna (d. 1420). A similar threat to Ottoman authority was posed by millenarian mystical movements like the Hurufiyya, a Sufi group inaugurated by Fadl Allah Astrabadi (d. 1394), who believed that the letters (huruf) of the alphabet signified certain metaphysical realities. The Ottomans’ cultivation of Ibn ‘Arabian Sufism, and their establishment of close relations with the Mevelvis, the Sufi order initiated by the famous Persian poet “Mevlana,” Jalal al-Din Rumi (d. 1273), can partly be seen as a response to these Sufi-minded threats to their authority. The Safavid threat provoked a similar response. “Being at once a Turkoman chieftainship, a Shiite dynasty, and a Sufi order,” the Safavid movement was a natural home for Sufi-minded Turkomans opposed to the Ottomans, “Red-head” Turkomans (a reference to their headgear) inspired by the Safavids’ synthesis of radical Shi‘i ideas about the Imam as a locus of divine manifestation and the Sufi notion of absolute obedience to the religious guide (pir). By way of response, “the Ottoman ruling elite opted to exploit Sufism to counter the Safavid propaganda.” This included reconceptualizing the sultan-caliph in cosmic, Sufi metaphysical terms. A more concentrated approach would have enabled the author to describe and analyze the most important texts and the ideas contained in them in greater depth. Often I found myself starring references and making notes to myself to explore texts (such as those listed in the passage just quoted) further, but I’d have valued more guidance from the author. 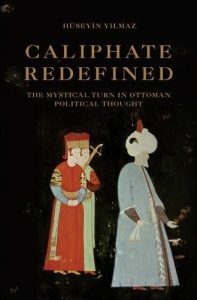 On a more conceptual level, while Yilmaz has done a wonderful job of establishing that there was indeed a mystical turn in Ottoman political thought around this time, he might also have considered the deeper historical roots of the cosmic or metaphysical conceptions of the caliphate. In a fascinating study, for instance, Nadia Jamil has shown how pre-Islamic Arabian ideas about the pole (qutb), codified in early Arabic poetry, were transposed onto the figure of the caliph in early Islam. While the Ottomans accessed similar ideas through the medium of Ibn ‘Arabian Sufi texts, it is important to recognise that such ideas were latent in the idea of the caliphate from the very beginning of Islam. These criticisms notwithstanding, this is a fascinating book. It contributes to the important trend in Islamic Studies, represented by works such as the late Shahab Ahmed’s What is Islam? The Importance of Being Islamic (Princeton, 2015), to highlight the centrality of Sufism within Islamic intellectual culture in the late medieval and early modern periods. Though principally aimed at specialists in Ottoman history, it should be read by anyone seeking a broader understanding of premodern Islamic civilization. Fitzroy Morrissey is a Fellow at All Souls College, Oxford.